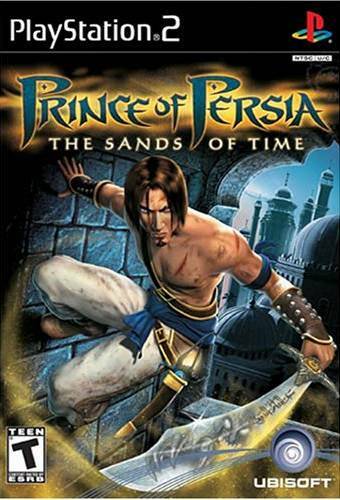 I loved the original Prince of Persia game ever since I first experienced it oh-so-long-ago at some store in a mall that just happened to be demo-ing it on a computer. Shortly after that I received it as a gift from my parents, one of the first computer games I ever owned, in all it's 5 1/4" floppy disc glory (which I still have somewhere, even though I haven't had a 5 1/2" floppy drive laying around anywhere for many years). So, when I heard that they were coming out with a PlayStation 2 version, I was both excited and apprehensive. I picked up Prince of Persia: The Sands of Time as a Christmas gift for my wife in 2003, and it's now almost a year later and she still hasn't played it. I, however, have played through it completely... twice. The first time through I didn't unlock the secret bonus of the original Prince of Persia game. Once I learned of it's existence, I pretty much knew exactly where it was hidden, and intended to play just up to that point, but once I got there and unlocked it, I realized I was still having a great time with this game, and decided to finish it off for a second time. Once I played the unlockable original version, I noticed that it didn't look quite like the version of Prince of Persia that I owned. The graphics looked like they had been improved, but then I assume that they probably originally had different versions of the game for different computer architectures. The feel of the game played just like I remembered it, and quickly reminded me how careful one has to be while playing this, as there is no life bar here, one misstep and you are dead! But enough about that, lets move on to this next-gen incarnation. Popping this game in for the first time almost immediately brought back those memories of the character's super-fluid movements while running, jumping, climbing... and lets not forget being impaled by floor spikes. This new game really felt like it had been reborn from the original, and not just franchised with the name like some other games that shall remain nameless. Plus, the graphics are absolutely remarkable, combined with the music and sound effects really envelops you in the mood. For the most part, the game play here is extremely smooth. Running on walls, navigating ledges, swinging from poles, and all the other cool moves made available are pretty simple to execute and look gorgeous. Even the battle movements are fluid, allowing you to take on multiple enemies with ease... you can strike with either your sword or knife, block and counter, dive out of the way, or jump over an enemy and slice them in the back. Still, that's not to say you won't get beat down now and then. Some battle do require actual strategy. The game gives you a choice of two different camera angles: a basic overhead view of the area, and a more zoomed in angle which follows the character and can be manually-controlled. Yet, there are times when even those aren't quite good enough to see what you need to see, in which case they made available a first person perspective just for looking around. Still, with all these camera choices, there are most definitely times when you will find yourself accidently jumping off the edge of one thing or another just because the game wouldn't allow you to position the camera at just the right angle. This can be controller-throwing frustrating. Luckily, the main gimmick of the game is that you can rewind time, so missing that ledge doesn't have to lead to your untimely death... so long as your magic knife has enough time-power left in it to enable an undo of your foul-up. Your special knife can also allow you to slow down time, which can help in battles when you're surrounded by a gang of enemies. So how do you fill your knife up with time-power? Why, by using it to deal lethal death blows to baddies, of course! Just keep in mind that there is a short waiting period after your knife steals the bad-guys life force, in which you won't be able to use its power. Overall, this is a really fun game. It looks and sounds wonderful, is easy to control, has an interesting story, cut-scenes that are to the point and don't drag, and implements a clever yet extremely useful and well executed gimmick. I would really have to recommend it to anyone who likes adventure, action, and puzzle-solving games. And now that it's under $20, there's no reason not to pick it up. The above content came from yours truly (contact me). The image came from Amazon.com.